Michael Smith, Richard Pawelka and Darren Nebergall. Scuba diving, to many, is considered a leisurely after-hours activity or hobby that takes place away from work. But for one skilled and fortunate group of civil engineers here at WSDOT, scuba diving is part of their job description. Our Bridge Preservation Office Dive Team is heading into its 10th year as an in-house dive team. The crew, consisting of Darren Nebergall, Jim Harding, Richard Pawelka, Michael Smith, Dave Bruce and Loren Wilson, takes care of 60 to 80 underwater inspections annually across the state. 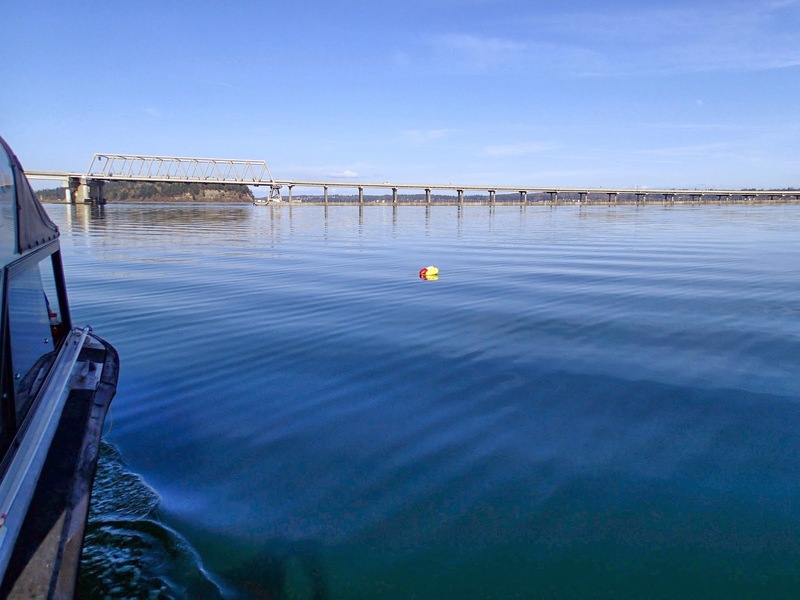 During a recent routine underwater inspection of the Hood Canal Bridge, the dive team found a large derelict net wrapped around one of the bridge’s 56-foot by 27-foot anchors. A derelict net is a fishing net that was either lost or cut loose from a fishing vessel. To complete the inspection, our dive team needed help removing the massive net. They contacted Kyle Antonelis with Natural Resources Consultants Inc., who works for the Northwest Straits Foundation. The Foundation is funded by the State of Washington through the Northwest Straits Initiative and the Washington Department of Fish and Wildlife. Antonelis had crews in the field removing derelict nets in the San Juan Islands and North Puget Sound at the time, and was able to quickly position a dive team and vessel at the Hood Canal Bridge. On Thursday, March 13, the vessel F/V Bet-Sea and its dive team took to the waters off Port Townsend and headed toward the Hood Canal Bridge. In anticipation of the arrival of the F/V Bet-Sea, Nebergall placed a buoy to mark the location of the anchor and derelict net, making it easier for the dive team on the F/V Bet-Sea to find. What they found was bigger than anyone anticipated. A large portion of a purse seine net, which is a large net used to draw in a large school of fish, was entangled around the 56-foot anchor. Remember the scene in Disney’s Finding Nemo movie where Dory and Nemo get caught inside a large fishing net? Yes, that’s a purse seine net. up with the derelict net. The F/V Bet-Sea dive crew reported finding several species of seabirds, fish and crabs entangled in the net. Photos they took revealed the underwater carnage being caused by the net. Antonelis praised the WSDOT dive team for reporting the net. Our dive team had provided underwater video, photos and vital information to Antonelis’ team so that they could successfully locate and remove the underwater hazard. 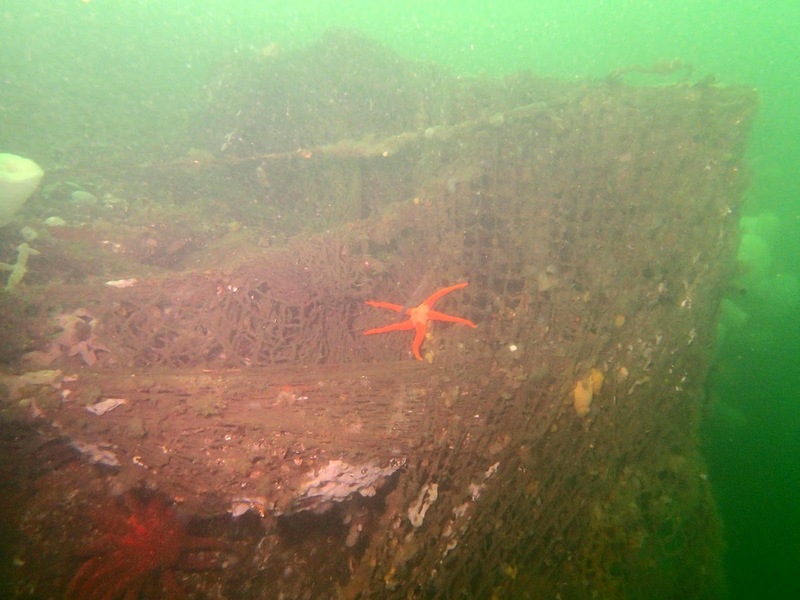 Derelict nets are a big problem in the waters of Puget Sound. One 2013 estimate showed that 3.2 million marine animals are entangled by these nets every year. Nebergall said the immediate response from Natural Resources Consultants Inc. allowed our Bridge Preservation team to finish its work with minimal delay. The net removal was funded through a $3.5 million grant through the Washington Department of Fish and Wildlife. This entry was posted on Monday, March 31, 2014 at 9:02 AM. You can follow any responses to this entry through the RSS 2.0. You can leave a response.